This is a thick and beautiful rug. The pattern is a little more bold than I would like but otherwise it is a great rug. Safavieh Handmade Soho Twigs Light Grey New Zealand Wool Rug - 3'6" x 5'6"
Safavieh Handmade Soho Twigs Light Blue New Zealand Wool Rug - 9'-6" X 13'-6"
Dimensions 3 ft. 6 in. x 5 ft. 6 in. This rug is absolutely beautiful! The picture reads a bit more teal then the real thing it is really a baby blue. It is soft, thick and absolutely perfect. Wonderful quality I would recommend this group of rugs made from New Zealand wool to everyone. Blue Twigs Rugs - SUPER!! My husband and I have been looking for nice rugs for our new bedroom for 2+ years. In the interim we had plain bare hardwood floors. Everything we saw was tacky or way more than we wanted to spend. My daughter recommended Overstock, and I found this rug in 2 perfect sizes - approximately 3x5 and 5x8, which was just what we wanted. They arrived in about 2 days and are wonderful! The rugs are very pretty, soft, quite thick and they do not "felt" as so many wool rugs do. I will buy from Overstock again! Great value!!!! I liked the rug well enough to keep it, however, I was very disappointed by the light colored yarns that look like fuzz and lint in the stems and flowers. I have been diligently trying to pick them out. Those yarns are not wool. They strike me as a way the manufacturer was trying to cut cost by using less wool yarn. In my opinion they lessen the quality. I purchased this rug, and a 5X8 for my bedroom after reading previous customers reviews! The rugs arrived in less than five days in perfect condition! The color states light blue, however it is more of an aqua blue, which was what I was looking for! The are very thick and feel great underfoot!! I am delighted with the rugs!!!! This rug is beautiful. I am so happy with it. It is VERY thick and dense... just wonderful under your feet.The color is a beautiful light blue, very soft. the conrtasting colors of the leaves goes so well with the blue.Yeah!! I wanted a rug I could put my feet on when getting out of bed in the early am. This rug is perfect! The color is a soft blue that appears almost grey at night but very light blue in the sunlight. It is also well made. Overstock delivered it within 2 days. I highly recommend this rug. I love the rug. I wanted a light aqua-blue and I got it with this rug. The rug is very soft and no shedding so far. It's very thick, well made and excellent quality rug. The twig-designs are very pleasing -- white twigs and soft-light brown twigs. For the guest bed-room it's perfect on either side of the bed. The size is better than most 3 x 5's, as the rug is 3.6 x 5.6 which looks great, I think. Don't hesitate to purchase this rug. It is beautiful and arrived within 2 days of placing my first Overstock order. Not only that...I had purchased and had to return (the color was not a match ) a very expensive rug that was from the same store Safaviah of the newly purchased area rug in NYC for 6 times the price ! Now this rug goes with the decor of the bedroom and I will be a devoted Overstock customer. Extremely happy and pleased. Simply very high quality. I purchased two of these carpets for our master bedroom, and was very pleased when they came. The colors are very true to those seen on the computer, and the quality of the carpets is excellent. They are so thick, in fact, that an expensive carpet pad is unneccessary. I would highly recommend this carpet to anyone looking for a beautiful carpet with excellent quality and a great price. I bought two of these to use in a hallway that isn't suited to typical narrow runners that are considerably narrower. This pair of rugs worked perfectly in that space, especially because the design takes on a nicely symmetrical appearance when the rugs are placed in opposite orientations. And, paired with the pads I bought at the same time--Set of Two Grid Non-slip Rug Pads (3' x 5')--the thickness is so satisfying underfoot. I was a bit worried about the color, fearing it might not work with the ice blue walls, but it is great. Seems to me that the combo of colors in this would make it work well many shades of light blues, greys, greens, tans and creams. Thick, Plush and very nice quality. The colour is a little more "green" than I hoped but actually works in the small space where I needed this rug. I'd rather not read information that makes me want to buy the rug, but rather information that's accurate about the rug. The "ivory" color was just white, and there was little noticable beige in the rug.It also promises a cotton canvas backing that is SUPPOSED to add duribility doesn't seem to apply to the corners of the rug because they came lose after a few weeks. 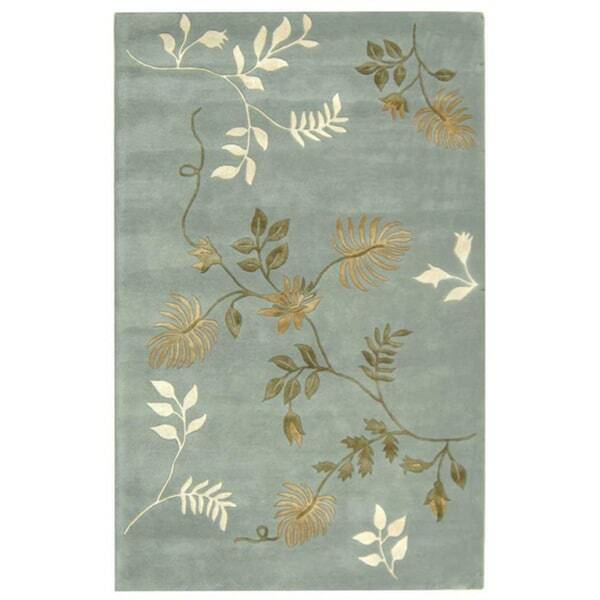 I'm returning this rug because on the site it looks light blue and says it has beige, white & gold twig designs, but it is a dusty blue, and the "gold" is a greenish beige/taupe. These rugs are well made. I have 4 in my home, all this same style, and I love them all. The color is a light dusty blue, with the pale green and beige running through it in the design. I get many compliments on these rugs. Had it for several years - beautiful rug! It is nice and thick - it does shed though; was in high traffic area but came back to life after each cleaning. Like it so much, looking for a place for it in my new home. Very beautiful, great price, works well with my decor. Only negative is similar to the other review, there are quite some loose wool, even after few vacuum. I love this rug! I've had mine for a few years, and it is in my entryway. It gets lots of traffic! Can't believe it's held up so well! I bought one for my daughter too. With two little kids and a dog, hers has held up very well! Very beautiful rug. Dense weave with very nice colors. Does not leave foot prints when you walk on it as the weave is so tight. I purchased 3 of these for my bedroom and love them. Purchased this rug almost 8 years ago and still looks great after years of wear and shampooing. The rug is thick and the colors have stayed true. This was a great investment. "I'm confused about the color of this rug from the description and the reviews which are contradictory (sea foam? aqua? teal? Baby blue?) Please could you send the Pantone color or some such ref ? Thanks"
Thank you for contacting us, dimpleu. The color is as shown- it’s a “light blue”- we don’t have a reference as “pantone” and keep in mid this is a hand-made product so there will be minor dye lot variance. This rug is as shown on pic onsite (keep in mind this is a 4.6 star rating with 41 reviews). Please let us know if you have any further questions. Safavieh Handmade Soho Vine Light Blue New Zealand Wool Rug - 3'6" x 5'6"